The new EOS R full-frame camera and its range of RF lenses reimagine optical excellence. Boasting a powerful 30.3 megapixel CMOS sensor and an entirely new lens mount system, the EOS R is perfect for capturing landscapes, portraits, and other visual storytelling opportunities. 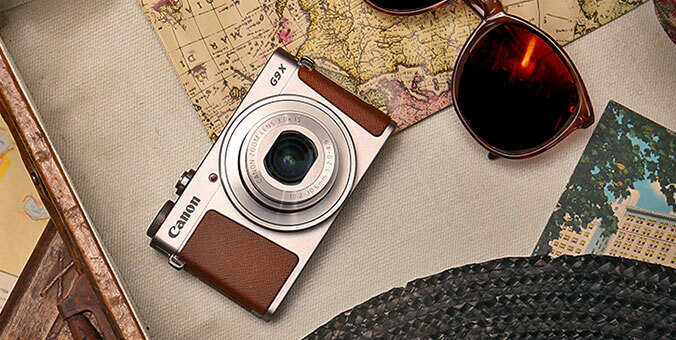 Capture every priceless memory from vacation. This camera packs full-frame performance into a compact DSLR body, making it easy to capture any type of travel-inspired photo op. Satisfy your wanderlust with a camera that can travel anywhere you go. The EOS Rebel SL2 is small enough to fit in your carry-on or weekender bag — all without compromising on style or performance. Looking for a versatile travel companion? The RF 50mm lens fits the bill. Engineered specifically for the new RF mount, this sharp and powerful prime lens offers a large maximum aperture, helping your images stay bright and detailed in a range of photographic situations. Interested in improving your travel photography skills? In this online learning photography class, Instagram icon, Natalie Amrossi, offers amateur and advanced photographers tips and techniques on capturing memorable photos from your travel destinations, whether close to home or abroad. Keep your creativity flowing with the EOS Rebel T7i Video Creator Kit. Perfect for vloggers, this kit comes equipped with a RODE® VideoMic GO™ microphone and a SanDisk 32GB SD card for hours of video fun. Print your memories in real life (IRL) with the IVY Mini Photo Printer. Pocket-friendly and colorful, this pint-sized printer creates 2” x 3” prints that are perfect for sharing with your closest friends. Simply peel off the backing and stick to mirrors, walls, notepads, and more. Whether you’re vlogging about the latest trend or documenting your favorite meal on Instagram, this powerful M-series lens offers a large maximum aperture, helping you create beautiful background blur and bright imagery, even in areas of low light. This compact, intuitively designed camera records Full HD videos in MP4 format, making it easy to capture and share your memories on your favorite social media channels. The EOS M50 is constantly on the move, just like you. Capture images and videos — in 4K Ultra HD resolution — by tilting the vari-angle 3.0-inch LCD monitor up or down for a boost of creativity. Life moves fast. Preserve each milestone and moment — in vibrant color — with the PIXMA TS8220 Printer’s 6-Color Individual Ink System. Document every can’t-miss moment, from first smile to first steps. This portable and lightweight camcorder allows up to 12 hours of built-in recording time — plus, offers an impressive 57x advanced zoom range — giving you the flexibility to capture all types of family fun. Run after your little tyke with ease. The PowerShot SX740’s DIGIC 8 Image Processor allows you to stay in the thick of the action, shooting up to 10.0 frames per second (with Auto Focus Lock on). Don't let any milestone pass you by. In this online learning photography class, blogger and photographer, Jennifer Borget, teaches new parents how to capture their child's major milestones and every candid moment in between. Once-in-a-lifetime trip in the works? The PowerShot G9 X Mark II’s ultra-slim, pocketable size makes it the go-to companion for your next outdoor excursion — you can even share your adventures on the run with built-in Bluetooth®8, Wi-Fi®9, and NFC10 connectivity. Tough and rugged activities deserve the camera equipment to match. The EOS 80D’s dust- and weather-resistant exterior can survive and provide beautiful photos of the roughest terrain. Full-time adventures warrant full-frame performance. The EOS 6D Mark II captures images in stunning color and clarity, packing full-frame optics into a durable, weather-resistant DSLR camera body. Before hitting the road, pack the PowerShot G5 X for the ride. This point-and-shoot camera offers a range of customizable settings, all in a convenient package that can fit easily in your backpack or picnic basket. Get close to nature without disturbing the action. The 10x32 IS binoculars are perfect for bird watching, whale watching, and more, offering up to 10x magnification and our advanced image stabilization. Take in the fresh air and scenic views. In this online learning photography class, Canon Explorer of Light, Jennifer Wu, offers insights on how to transform amazing landscapes into astounding photos. No need to run to the library to find a quiet place to work. Enable the PIXMA TS3120’s Quiet Mode to reduce the printer’s operational noise, helping you — and your roommates — stay focused and distraction-free. The EOS Rebel T7 is an affordable introduction to DSLR photography, offering built-in Wi-Fi® and NFC connectivity to capture and share memories on the go.6 This exclusive bundle also comes paired with the Canon Insider Guide: EOS Rebel Series online learning photography class, helping you master the basics. This mirrorless camera boasts a 3.0-inch tilt-type LCD touchscreen that’s perfect for taking college selfies — plus, offers a variety of colorful face jackets to choose from, helping you celebrate your individuality. Document your college years, from first semester to last. This compact point-and-shoot camera captures high-quality photos and videos with an impressive 1.0-inch, 20.1 megapixel CMOS sensor. Maximizing space in dorm rooms is tough. Count on the imageFORMULA DR-C225W II’s small footprint to fit in even the tightest of places. The EOS Rebel T7 is an affordable introduction to DSLR photography, offering built-in Wi-Fi® and NFC connectivity to capture and share college memories on the go — straight from your favorite mobile devices.6 This exclusive bundle also comes paired with the Canon Insider Guide: EOS Rebel Series online learning photography class, helping you master the basics. Gift your favorite creative spirit with the PIXMA TS9521C. Designed with crafting in mind, this innovative printer offers versatile paper support that’s perfect for a range of DIY-related projects, including 7” x 10” greeting cards and 12” x 12” borderless scrapbooking prints. Ignite your inner artist with the EOS 77D. Capture vibrant colors and fine details with the 24.2 megapixel CMOS (APS-C) sensor — plus, customize your images with a variety of filters and effects, including monochrome, toy camera, fisheye, water painting, and more. Celebrate your favorite images in a large way. The PIXMA iP8720 features a 6-Color Individual Ink System, including gray ink, to produce vibrant, borderless lab-quality photos — up to 13” x 19” in size. Add style and functionality to your home office. This printer features an innovative 5-Color Individual Ink System, plus front and rear paper cassettes that can handle photos and documents with ease. When desk space is limited, turn to the imageCLASS DR-C225W II document scanner to kick clutter to the curb. This scanner offers a sleek, space-saving design, scanning documents as fast as 25 pages per minute. Boost productivity and improve your company’s workflow. The imageCLASS D1550 is designed exclusively for small office environments, offering all-in-one functionality that can meet — and exceed — any business demand. Looking to transform your office into an eco-friendly workplace? Consider the imageCLASS MF731Cdw’s green-inspired solutions. Conserve energy and cut back on office expenses with features such as duplex printing, energy saving mode and the option to purchase high-capacity toner. Sporting photographer apparel — including a tan vest and a red cap and t-shirt — this exclusive brown plush teddy bear makes the perfect collectible item for enthusiasts and fans-in-the-making. With a fun graphic that pays homage to our most iconic cameras over the past 80 years, this insulated bottle features an attached lid that snaps closed, keeping drinks piping hot or ice cold for up to 6 hours. Featuring a stand and display case, this scale replica model includes a miniature 5D Mark IV body with removable 24-70mm lens, easily making a statement as a conversation piece in your home or office. Show off your Canon flair with our exclusive regular fit women's V-neck t-shirt. Made with over 60 percent bamboo-based fiber, this soft white tee features a timeline graphic that honors Canon's most iconic cameras. Whether you're a tech enthusiast or simply a photography fan, our exclusive regular fit men's t-shirt pays tribute to Canon's time-honored history including iconic cameras such as the 1934 Kwanon and the 2016 EOS 5D Mark IV. Give the gift of Canon by browsing our official collection of merchandise and gifts. 1Requires mobile device to be connected to the Canon IVY Mini Photo Printer via Bluetooth® and the Canon Mini Print App, available for free on the App Store and at Google Play. Compatible with mobile devices running iOS 9.0 or later, and Android devices running Android 4.4 or later. 2Wireless printing requires a working Ethernet network with wireless 802.11b/g or n capability or a camera that supports DPS over IP. Wireless performance may vary based on terrain and distance between the printer and wireless network clients. 3Wireless printing and scanning requires a working network with wireless 802.11b/g /n/ac or ad capability. Wireless performance may vary based on terrain and distance between the printer and wireless network clients. 4The number of AF points, cross-type AF points and Dual cross-type AF points vary depending on the lens used. 5Page yield of ink bottles used for initial setup is lower than the replacement, as a certain amount of ink is consumed to fill into the print head during the setup (charging the print head initially). Page yield is the estimated value based on Canon individual test method using the ISO/IEC 24712 chart and continuous printing simulation with the replacement ink bottles after initial setup. Page yield of color inks is an average yield of cyan, magenta and yellow inks combined. Page yield varies significantly depending on content printed and other factors. 6,000 (black) and 7,000 (color) printed page yields are approximate, based off document pages printed. 6Compatible with iOS® versions 9.3/10.3/11.0, Android™ smartphone and tablet versions 4.4/5.0/5.1/6.0/7.0/7.1/8.0. Data charges may apply with the download of the free Canon Camera Connect app. This app helps enable you to upload images to social media services. Please note that image files may contain personally identifiable information that may implicate privacy laws. Canon disclaims and has no responsibility for your use of such images. Canon does not obtain, collect or use such images or any information included in such images through this app. 7Distance based on select models. Wireless range might be affected by the environment. 8Compatible with select smartphone and tablet devices (Android™ version 5.0 or later and the following iOS® devices: iPhone 4s or later, iPad 3rd gen. or later, iPod Touch 5th gen. or later) equipped with Bluetooth® version 4.0 or later and the Camera Connect App Ver. 2.0.10. This application is not guaranteed to operate on all listed devices, even if minimum requirements are met. 9Compatible with select smartphone and tablet devices (Android™ version 5.0 or later and the following iOS® devices: iPhone 4s or later, iPad 3rd gen. or later, iPod Touch 5th gen. or later) equipped with Bluetooth® version 4.0 or later and the Camera Connect App Ver. 2.0.10. This application is not guaranteed to operate on all listed devices, even if minimum requirements are met. 10Compatible with Android™ smartphone and tablet versions 4.0/4.1/4.2/4.3/4.4/5.0/5.1/6.0. 11As of February 25, 2018. EOS cameras sold up until June 2014, as well as EOS Rebel T7, EOS Rebel T6, EOS M6, EOS M5 and EOS M3 do not support "AI.B full-auto."